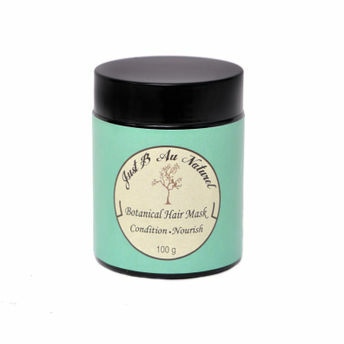 Just B AU Naturel's Botanical Hair Mask is a transforming mask with potent herbs and clays. It promotes growth, conditioning, and nourishment of hair with chemical-free natural ingredients. This nutritious natural botanical powder restores your hair to its original, healthy state using freshly powdered herbs and amazing mineral rich clays and proteins. It is suitable for all hair types. This sun dried hair mask will help to calm itchy scalps, balance excess oil and promote strong and healthy hair growth. Amla - Strengthens the hair follicles, encouraging hair growth and its rich Vitamin C content helps premature graying and helps to darken hair. Bhringraj - Has proven Hair regrowth properties. Alopecia sufferers will find bhringraj to be beneficial in promoting hair regrowth. Hibiscus - Helps and prevents the premature graying of hair. Also conditions the hair and keeps it bouncier and shinier. Brahmi - Known to strengthen the roots of the hair and stop hair fall. Helpful in reducing split ends. Rhassoul Clay - It is an amazing hair cleanser. It prevents hair fall, dandruff and promotes hair growth.